Arsenal Pulp Press, 9781551525341, 219pp. Craftivism is a worldwide movement that operates at the intersection where craft and activism meet; Craftivism the book is full of inspiration for crafters who want to create works that add to the greater good. 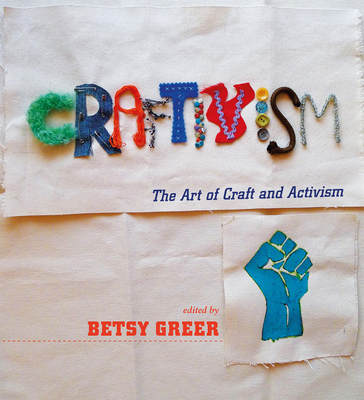 With interviews and profiles of craftivists who are changing the world with their art, and through examples that range from community embroidery projects, stitching in prisons, revolutionary ceramics, AIDS activism, yarn bombing, and crafts that facilitate personal growth, Craftivism provides imaginative examples of how crafters can be creative and altruistic at the same time. Artists profiled in the book are from the United States, Canada, the United Kingdom, Australia, and Asia, and their crafts include knitting, crocheting, sewing, textiles, pottery, and ceramics. There's the Brooklyn writer who creates large-scale site-specific knitted installations; the British woman who runs sewing and quilting workshops for community building and therapy; the Indonesian book maker and organizer of a DIY craft center; and the Oxford, England, cultural theorist and dress designer. A wonderful sense of optimism and possibility pervades the book: the inspiring notion that being crafty can really make the world a better place. Betsy Greer is a writer, crafter, researcher, and the author of Knitting for Good : A Guide to Creating Personal, Social and Political Change Stitch by Stitch. She also runs the blog craftivism.com and believes that creativity and positive activism can save not only the soul, but also the world. Betsy Greer: Betsy Greer is a writer, a maker, and a researcher, and the author of Knitting for Good! : A Guide to Creating Personal, Social, and Political Change Stitch by Stitch. She runs the blog craftivism.com and believes that creativity and positive activism can not only save the soul, but also the world.